What Would You Do For $5? Please don’t answer the question here — SitePoint is a family-friendly site! Instead, head over to Fiverr.com and offer your services there. We may all want to be millionaires, but you have to start somewhere. 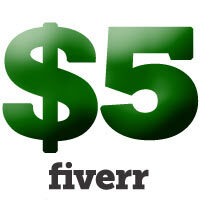 Fiverr is a new social networking site which allows you to offer a product or service for just $5. You create a tweet-like “gig”, receive an order, and get your money 24 hours after it’s accepted by the buyer — minus $1 commission for Fiverr themselves. The website is unashamedly based on Twitter and uses the network to publicize services. There are various categories ranging from Silly Stuff to Social Marketing. SitePoint visitors will be most interested in the Technology, Programming, Graphics and Business sections. Wow. I might just give up the day job and outsource everything to Fiverr users! I like the idea. 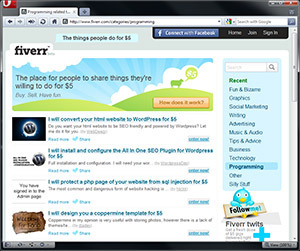 The site is amusing, Fiverr protects your identity, and it provides an escrow service for money exchange. Buyers are able to rate sellers on the quality of their service so you can be reasonably confident when purchasing a gig. But hey, even if you have a bad experience, what’s the most you’re going to lose? Incidentally, neither I or SitePoint have any affiliation with Fiverr.com. We haven’t been paid for this article. Not even $5.